We’d love your help. 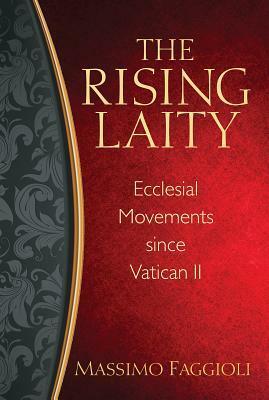 Let us know what’s wrong with this preview of The Rising Laity by Massimo Faggioli. To ask other readers questions about The Rising Laity, please sign up. Historian and theologian, Massimo Faggioli, brings his intellectual weight to the question of the rise of the so-called 'new ecclesial movements' in the life of the Church, particularly from the perspective of his native Italy. Tracing their development from before the Second Vatican Council, Faggioli concludes his study with an examination of the place of these movements in the contemporary pontificate of Francis. Challenging the long-prevailing view, often held by the movements themselves, that Historian and theologian, Massimo Faggioli, brings his intellectual weight to the question of the rise of the so-called 'new ecclesial movements' in the life of the Church, particularly from the perspective of his native Italy. Tracing their development from before the Second Vatican Council, Faggioli concludes his study with an examination of the place of these movements in the contemporary pontificate of Francis. Challenging the long-prevailing view, often held by the movements themselves, that they are the 'fruit' of Vatican II, Faggioli highlights the way in which the post-Vatican II pontificates, particularly those of John Paul II and Benedict XVI have used support for the movements to subtly shift the understanding of what truly happened at the Council. This reclaiming of the 'spirit' of the Council, which Faggioli suggests was contrary to the ecclesiological developments of the Council, placed the movements in a privileged place within the Church of John Paul II and Benedict XVI. Faggioli contends that the contemporary pontificate of Francis, with its refocusing of ecclesiological understanding on the primacy of the traditional parish as the place of mission, has challenged the movements' existence as being the Church rather than being part of the Church. Well written, well referenced, and well argued, this book is a must read for those who seek to understand the developments in contemporary ecclesiology and to do so from a historically sustainable position. The rise of the laity in the Catholic Church is at the same time one of the successes of Vatican II, one thing that all Catholics take for granted, and one item still on the agenda of Church reformers today. The "new Catholic movements" are the most relevant embodiment of this new phenomenon in a Church become global, but also one of the least researched fields by Catholic scholars. The case of the new Catholic movements is a key element in the effort to understand the Catholic Church in transition, like the Church of Pope Francis. I bought this because I don't understand the need of some Catholics to join movements...I understand it a bit better now. The historical background is crucial to understanding this, as with any topic, because knowing the roots of the rise of movements illuminates the time period for those living in our current time. It answers the "why" and "how" of the question. I am an ordinary in-the-pew Catholic though I taught CCD for 9 years long ago. More recently I have been both learner and teacher in Adult Faith Formation. There I encountered people who were part of a couple of movements and again, asked myself, why would people do this? I'll read this again for deeper understanding. As always, Professor Faggioli brings light to the topic he is exploring. This is a book for the curious. The Roman Catholic tent is large and includes lots of points of view. It can only benefit us all if we continue to learn so that we better comprehend how we got to the place we are now. This is a fascinating book. What it does very well is show how in the period after Vatican II, the movements often become a vehicle for a form of ultramontanism that resisted the Council's aims and which projected a picture of ordinary Catholicism as inadequate. Francis has made efforts to ensure that the movements are integrated within the parochial and diocesan life and to mitigate their most authoritarian elements. Massimo Faggioli is assistant professor of theology at the University of St. Thomas in St. Paul, Minnesota. He has written extensively on modern Church history and on Vatican II. He is the author of Vatican II: The Battle for Meaning (Paulist, 2012).